D. Harlan Wilson is a professor of English at Wright State University–Lake Campus. He is the author of Cultographies: They Live, Technologized Desire: Selfhood and the Body in Postcapitalist Science Fiction, and over twenty novels and fiction collections. He recently answered some questions about his new book J.G. Ballard. Q: Your book is the first full length study of Ballard’s writing since his death in 2009. How does your book differ from previous studies of Ballard? 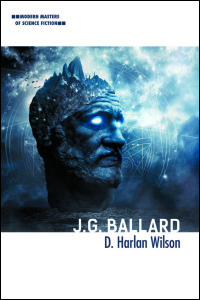 Wilson: In addition to being a complete overview of his life and work, my book takes a revisionist view of Ballard and re-situates him in the science fictional milieu from which some scholarship has attempted to remove him. There’s this misnomer that Ballard got sick of SF and “abandoned” the genre. He even suggested it himself a few times, but he was talking about genre SF and the rules and strictures imposed by SF editors and publishers, who wanted it written a certain way, and who effectively put a muzzle on what was supposed to be the genre of innovation, something that continues to plague SF today. Most SF was and still is bad. Ballard knew it. But he saw the latent potential in the genre, and he aspired to unlock and cultivate that potential, writing a genuinely innovative literature that’s almost without peer. Even though he wrote against genre norms, he still wrote within the margins of the genre. My thesis is that, despite SF, he was always an SF author, from the beginning to the end of his career. To varying degrees, all of his writing exhibits SF tropes, estrangements and sensibilities. Even mainstream novels like Empire of the Sun and The Kindness of Women foreground themes like technological subjectivity and media pathology. Unlike other books on Ballard, mine looks at the entire corpus of his stories and novels as a kind of map of SF that attempts to push the genre in new directions while inherently critiquing it. My book also contains a complete bibliography of JGB’s writing and much of the secondary criticism on him. For readers and critics new to Ballard, I think it will be a useful primer. For fans and scholars of Ballard, there are fresh readings of his texts. Q: How would you describe J.G. Ballard’s progression as a writer? Wilson: In terms of science fiction, a bird’s-eye view of his progression as a writer shows him slowly moving from the center to the outer limits of the genre. His first novel, The Wind from Nowhere, published in 1962, falls into the “cozy catastrophe” sub genre of SF that had become popular in the 1950s. These stories are typically set in post apocalyptic worlds that have been ravaged by environmental or biological cataclysms. His subsequent three novels, all published in the 1960s, are set in similar worlds, but already we can see Ballard turning his back to the sun, focusing more on the psychology of his characters and employing surrealist techniques. His last novel, Kingdom Come, came out in 2006. By this time, Ballard had thrown himself almost all the way into the human psyche. His oeuvre is better classified not as sci-fi but psy-fi. In general terms, Ballard’s writing—the prose, I mean—was always relatively strong. Most authors improve over the span of their careers. Their writing changes, at least. Ballard remained fairly constant, with a powerful grip on the flows of language from start to finish. Q: How did Ballard’s writing differ from Golden Age science fiction? Wilson: The Golden Age of SF began in the late 1930s when Campbell took over the editorship of the American pulp magazine Astounding Stories, which was founded in 1926 by Gernsback. Campbell changed the title to Astounding Science–Fiction in 1938 and cultivated authors like Isaac Asimov, A.E. van Vogt, Robert Heinlein, Theodore Sturgeon, Clifford D. Simak, L. Ron Hubbard and Jack Williamson. During this period, magazines were more popular than books, and the stories published in magazines were largely written by men for boys. They were mainly space operas with simple narrative structures that combined technological realism and the masculine, adventure-story ethos of the preceding pulp era. Golden Age SF splintered after World War II as authors deviated from customary storylines, tropes and characters. Ballard was an exceptionally sharp splinter. His highly literary writing made the Golden Age look like the child’s play it often was. Instead of hard, heroic space operas, he wrote soft, anti-heroic psychodramas and became a forerunner of New Wave SF, which turned Golden Age SF on end, foregrounding dystopia, achronology, experimentalism, psy-fi, and so on. New Wave authors subverted the idea that technological progress was innately positive and psychologically “healthy.” Much of Ballard’s fiction investigates the creative pathologies that result from and are facilitated by technological forces and the media environment. Q: What was Ballard’s conception of inner space and why was this so influential in New Wave science fiction? Wilson: If pulp and Golden Age SF explored outer space, Ballard and other New Wave authors explored inner space. Martin Amis once called Ballard the “apostle of inner space,” and rightly so, but Ballard didn’t actually coin the term. Novelist J.B. Priestly introduced it in a 1953 essay, “They Come from Inner Space,” arguing that SF should focus more on “the hidden life of the psyche” rather than “traveling to the other side of the sun.” Ballard did this in his fiction and directly addressed the concept in “Which Way to Inner Space?” where he famously states: “The only truly alien planet is Earth.” Published in 1962, the essay was a benchmark work for New Wave SF, a narrative speakeasy that flouted pulp prohibitions and celebrated modernist subversion. Ballard wanted to see a shift from the physical sciences to the biological and psychological sciences. He drew heavily on the aesthetics of classic surrealism to scaffold his inner spatial worlds. At heart, he was more of a painter than a writer. He once said that his novels and stories are all paintings. This is certainly at the core of his exploration of inner space. Q: What piece of J.G. Ballard’s writing is your favorite and why? Wilson: I think it might be “The Drowned Giant.” It’s actually the first thing I read by Ballard when I didn’t know who he was and I bought a collection of his stories at a music store in Boston because I thought the cover was cool-looking. There’s a Kafkaesque tenor to it that deeply resonates with me, and I remember being impressed by the prose as much as the ideas. The story includes familiar Ballardian themes, but it’s different than a lot of his fiction, and it’s more a work of fantasy than SF. In “The Drowned Giant,” a dead, colossal humanoid washes onto a beach and becomes a media sensation whose popularity surges, drawing enthralled crowds, then dwindles to nil, as meaningless as the passing of a celebrity spat on TMZ. In the end, the giant is altogether forgotten, and its body is dismantled and taken away. I love the way Ballard punctuates the absurdity of the human condition in this story. I’ve never read anything quite like it.